Waxing is quick and efficient, this method of temporary hair removal employs the purest honey wax. Honey wax exfoliates the dead cells and is excellent for all skin types. Experienced licensed cosmetologists give special attention to professional and busy men and women. Sugaring is a similar method of hair removal. It dates from the ancient civilizations of Mesopotamia, Egypt, and Greece. Sugaring paste is made from 100% natural ingredients. It will remove hair while exfoliating the dead skin cells, protecting against dry itch eczema and psoriases, and leaving the skin intact. Prices upon request and are subject to change anytime. For Laser Hair Removal information click here. The state of the art Airbrush Tanning System applies a solution through an airbrush to your skin. The active ingredient in the solution is DHA, which reacts with the amino acids in the outer layer of the skin. This reaction develops a beautiful instant tan that will intensify within 3-4 hours leaving a natural tanning looks on the skin. The entire process takes 1/2 hour to 45 minutes with exfoliation. It is important after 24 hours your skin is well moisturized; your tan will last much longer than if your skin is dry. We recommend Tan Moisturizer - Paraben Free - lotion. Airbrush tanning treatments are completely safe. The tanning solution is made up from all natural ingredients and the ingredient DHA (dihydroxyacetone) has been FDA approved for cosmetic applications for over 30 years. These products are hypo-allergenic for people with sensitive skin. We provide you with the safest, healthiest and best looking tan in New York City with the highest quality products and tools available in the market. For your convenience, we use a Super Flow Ventilation Booth that eliminates all fumes and over-spray generated by the airbrush. Airbrush Make-up is also available. Ideal for all your special occasions. Call us for more details at (212)355-7055. 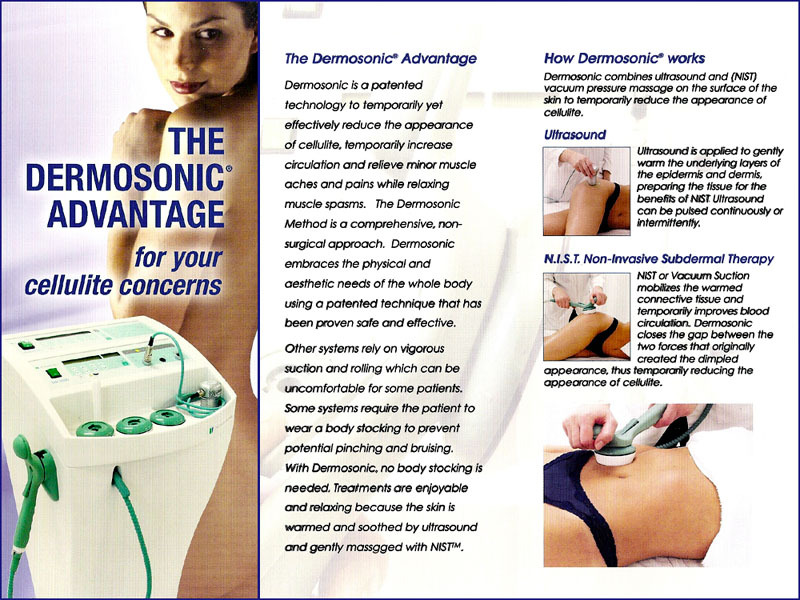 Dermosonic Advantage - Ultrasound, Non-Invasive Subdermal Therapy. This method embraces the physical and aesthetic needs of the whole body to reduce the appearance of cellulite. About 80% of adult female population has cellulite caused by inevitable lifetime hormone changes and genetics. Dermosonic treatments are pain free and deliver tremendous results even after the first session leaving the skin better-looking and bruise free. The number of treatments depends on individual needs, age and lifestyle. Dermosonic and Skintonic treatments increase local blood circulation and strengthens muscles for better, healthier-looking bodies and skin. 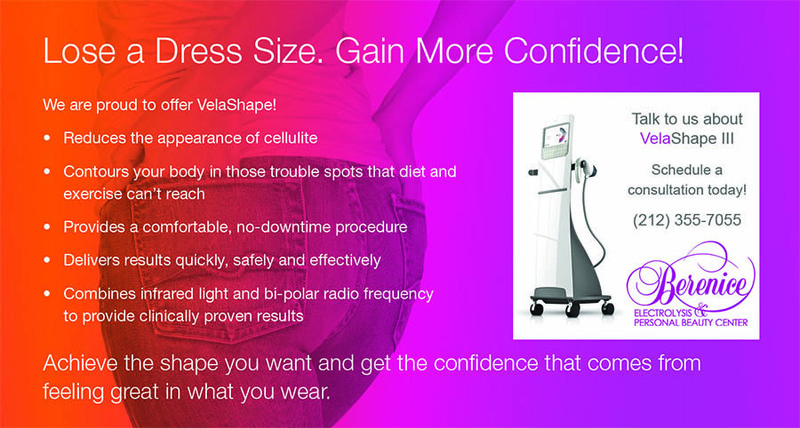 VelaShape III is the powerful and latest therapeutic body contouring treatment machine available at Berenice’s Electrolysis and Beauty Center that diminish cellulite and help reducing extra pounds from different areas of the body in a non-invasive manner. The new formula of IR (infrared light), bi-polar RF (radio frequency) and vacuum effect combined with the improvement of a higher and precise heater allows for a deeper and faster penetration of radio frequencies waves into specific areas of skin that is traduced to faster, painless, great skin reduced results on fewer treatments. The Vela Shape III is a very secure treatment without secondary effects on the affected area. It will promote an increase in circulation, lymphatic drainage, cellular metabolism and collagen depositing which will bring you an overall improvement in skin structure and texture by reducing localized skin laxity. Lymphatic Drainage are methods recommended by leading plastic surgeons to reduce the swelling that often accompanies cosmetic procedures.